Background: Persons at risk for familial Alzheimer disease (FAD) provide a model in which biomarkers can be studied in presymptomatic disease. Methods: Twenty-one subjects at risk for presenilin-1 (n = 17) or amyloid precursor protein (n = 4) mutations underwent evaluation with the Clinical Dementia Rating (CDR) scale. We obtained plasma from all subjects and CSF from 11. Plasma (Aβ40, Aβ42, F2-isoprostanes) and CSF (F2-isoprostanes, t-tau, p-tau181, Aβ40, Aβ42, and Aβ42/Aβ40 ratio) levels were compared between FAD mutation carriers (MCs) and noncarriers (NCs). Results: Plasma Aβ42 levels (25.1 pM vs 15.5 pM, p = 0.031) and the ratio of Aβ42/Aβ40 (0.16 vs 0.11, p = 0.045) were higher in presymptomatic MCs. Among MCs, those with CDR scores of 0.5 had lower plasma Aβ42 levels than those with CDR scores of 0 (14.1 pM vs 25.1, p = 0.02). The ratio of Aβ42 to Aβ40 was also reduced in the CSF (0.08 vs 0.15, p = 0.046) of nondemented MCs compared to NCs. Total CSF tau and p-tau181 levels were elevated in presymptomatic FAD MCs. CSF levels of F2-isoprostanes were also elevated in MCs (n = 7, 48.6 pg/mL) compared to NCs (n = 4, 21.6 pg/mL, p = 0.031). Conclusions: Our data indicate that Aβ42 is elevated in plasma in familial Alzheimer disease (FAD) mutation carriers (MCs) and suggests that this level may decrease with disease progression prior to the development of overt dementia. We also demonstrated that the ratio of Aβ42 to Aβ40 was reduced in the CSF of nondemented MCs and that elevations of t-tau and p-tau181 are sensitive indicators of presymptomatic disease. Our finding of elevated F2-isoprostane levels in the CSF of preclinical FAD MCs suggests that oxidative stress occurs downstream to mismetabolism of amyloid precursor protein. The biochemical and pathologic changes responsible for the clinical manifestations of Alzheimer disease (AD) are thought to begin years or even decades prior to the development of the overt symptoms of the disorder. The characterization of the relationship between various biochemical markers and disease status allows us to better understand the causes of the illness, enhances our ability to diagnose the disorder in its earliest preclinical stage, and ultimately may lead to more effective treatments for AD. Study of the extracellular plaques characteristic of AD that consist largely of depositions of beta-amyloid protein (Aβ) focused interest on this protein as playing a pivotal role in the pathogenesis of the disease.1 The subsequent identification of genes causing autosomal dominantly inherited forms of the disease (familial AD or FAD) that cause aberrant processing of amyloid precursor protein (APP) into the more fibrillogenic form of the beta-amyloid protein (Aβ42) yielded clues as to the mechanism by which abnormal metabolism of APP causes AD, at least in these familial cases. 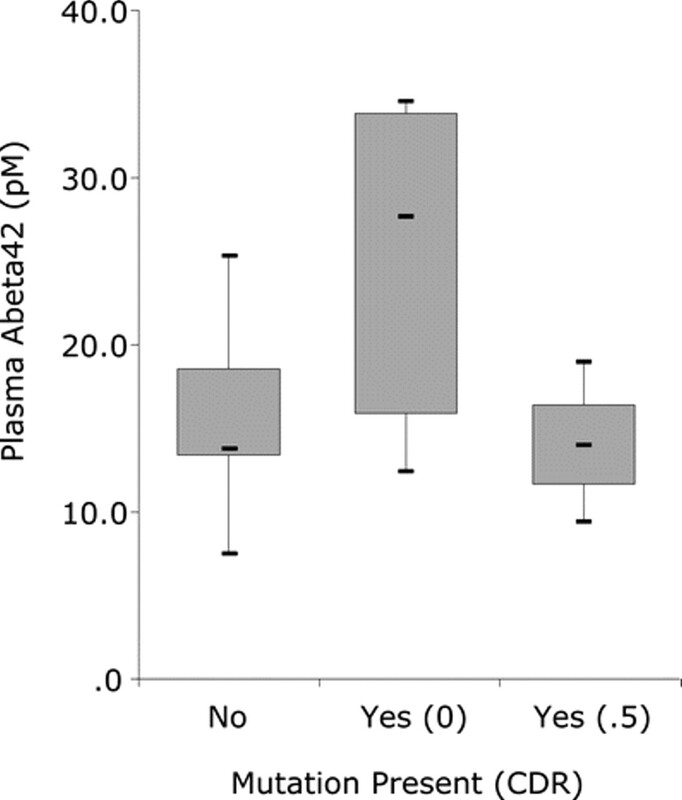 Plasma levels of Aβ42 have been demonstrated to be elevated prior to symptom onset in persons carrying mutations pathogenic for FAD2 and in those who go on to develop sporadic AD.3 Plasma Aβ42 levels have also been observed to decrease in otherwise healthy elderly controls who showed cognitive decline.4 In another study, however, levels in subjects with established AD were not found to be different from those in patients with mild cognitive impairment (MCI) or either healthy controls or patients with Parkinson disease.5 Most studies have shown that Aβ42 levels in the CSF are decreased in persons with MCI6 and sporadic AD.7,8 A potential factor confounding these studies, which might in part explain their varied findings, is uncertainty regarding the specific type and stage of dementing illness present. The reliability with which persons carrying FAD mutations develop the illness, the predictability of the age at onset,9 and the lack of concurrent medical illnesses in this relatively young otherwise healthy cohort help control for this uncertainty. Converging lines of evidence suggest that oxidative damage plays a role in the development of AD and other neurodegenerative diseases. Various indices of oxidative damage in biologic tissue have been employed and 8,12-iso-iPF2αVI (iPF2a or F2-isoprostanes), markers of lipid peroxidation, have been particularly well characterized. They have been found to be elevated in the urine, plasma, and CSF of persons with AD and MCI.15,16 Furthermore, F2-isoprostanes were found not to be elevated in brain tissue from persons with frontotemporal dementia, suggesting that elevated levels may be relatively specific for AD.17 One study demonstrated increased oxidative stress in lymphocytes and fibroblasts from persons with APP and presenilin-1 (PSEN1) mutations, suggesting that oxidative damage plays a role in FAD as well.18 If elevated F2-isoprostane levels are found in young preclinical FAD mutation carriers, this would be supporting evidence that oxidative damage is important in the development of the disease. On the other hand, if these elevations are not found early (or at all) in the course of FAD, it might be concluded that oxidative stress plays a more important role in sporadic AD than in FAD. Inherited forms of AD due to alterations in the PSEN1 or APP genes, in which the underlying cause of the disease are thought to be understood, provide a model in which the relationship of various biochemical changes to the “amyloid cascade” can be tested. In the current study we measured levels of plasma (Aβ40, Aβ42, F2-isoprostanes) and CSF (F2-isoprostanes, t-tau, p-tau181, Aβ40, and Aβ42) biomarkers with putative relationships to AD status and progression in persons at risk for FAD to help clarify these relationships. We hypothesized that Aβ42 would be elevated in the plasma and decreased in the CSF of presymptomatic persons carrying FAD mutations. Furthermore, we hypothesized that CSF levels of t-tau and p-tau181 would be elevated in FAD mutation carriers. We suspected that oxidative stress would play a more minor role in FAD of young onset and therefore did not expect there to be differences in F2-isoprostane levels between FAD mutation carriers (MCs) and non-carriers (NCs). The Clinical Dementia Rating Scale (CDR) was performed with an unrelated informant and with the subject by the principal investigator. The CDR is a structured interview with input from both the subject and an informant who knows the subject well.26 In the CDR, asymptomatic persons are rated 0, and persons with questionable cognitive impairment are rated 0.5. Scores of 1, 2, and 3 represent mild, moderate, and severe stages of dementia. In all but two subjects who had undergone clinical presymptomatic testing, ratings were performed blind to subjects’ genetic status. All subjects signed written, informed consent. Subjects were informed they would be tested for the FAD mutation for which they were at risk but in the context of the research protocol would not be told the result. All study procedures were approved by the Institutional Review Boards at UCLA and the National Institute of Neurology and Neurosurgery in Mexico City. Plasma samples were obtained from all subjects and 11 of the 21 subjects consented to and underwent lumbar punctures. Blood was drawn in the morning in a fasting state. Thirty cubic centimeters of blood were centrifuged, aliquoted into 0.5 mL siliconized polypropylene Eppendorf tubes, and stored at −80°C within 2 hours of being drawn. CSF was collected at various times of the day using a 24 gauge Sprotte needle and then centrifuged, aliquoted into 0.5 mL siliconized polypropylene Eppendorf tubes, and frozen to −80°C within 2 hours of being obtained. All samples were sent to collaborators according to a unique identifier without any associated clinical or genetic information. The resulting values were forwarded to the principal investigator who analyzed the data. All biochemical analyses were therefore performed in a blinded fashion. Frozen plasma samples were sent overnight on dry ice to the laboratory of Steven Younkin at Mayo Clinic, Jacksonville, FL. Aβ40 and Aβ42 were measured using a sandwich ELISA technique employing Takeda BAN50/BA27 and BNT77/BC05 antibodies, respectively. Each sample was assayed in duplicate and normalized to four control plasma samples. All samples were run on a single plate. A subset of 16 plasma samples were analyzed twice. The Pearson correlation coefficient between the first and second assays for plasma Aβ42 was 0.949 (p < 0.001) indicating good test-retest reliability. CSF Aβ levels were measured independently in three different laboratories. The results in two laboratories, including that of author G.C. at UCLA, correlated well. The methodology used and results obtained at UCLA are reported here. CSF was analyzed for Aβ42 and Aβ40 using Luminex reagents from Biosource Division of Invitrogen (Camarillo, CA) and X-MAP technology according to the manufacturer’s instructions. The Luminex 200 system and the xPONENT 3.0 software from Luminex (Austin, TX) were used for acquisition and analysis. Standard curves were constructed from authentic standards included with each kit: 7 to 5,000 pg/mL for Aβ42, 7 to 5,000 pg/mL for Aβ40. The lower limit of quantification was 21 pg/mL for Aβ42 and 62 pg/mL for Aβ40. Each CSF sample was analyzed in duplicate and these results were then averaged for further statistical analyses. The coefficient of variance for each assay was 4.7% for Aβ42 and 5.4% for Aβ40. CSF samples were sent overnight on dry ice to Athena Diagnostics who measured total tau (t-tau) and p-tau181 using immunoassays. Determination of tau and p-tau181 concentrations in CSF were performed by ELISA methodology as provided by Innogenetics, NV (Innotest hTAU Ag and Innotest Phospho-tau).7,8 Concentrations were determined from standard curves using recombinant human total tau protein, and a synthetic 34 amino acid peptide phosphorylated at the position equivalent to threonine-181 in the tau protein. For genetic testing blood samples were coded according to a unique identifier and forwarded to the laboratory of Daniel Geschwind at UCLA. DNA was extracted and apolipoprotein E genotyping performed using standard techniques. The presence of A431E and L235V substitutions in PSEN1 were assessed using RFLP analyses. The presence or absence of the G206A substitution in PSEN1 (n = 1) was assessed directly with bidirectional sequencing. The presence of the v717i substitution in APP was assessed with direct sequencing. The age at onset of disease in FAD tends to be consistent within families but can vary between families.9 Therefore, in order to make subjects comparable with regard to the time interval over which they would be expected to develop dementia, each subject’s age relative to the typical age at disease diagnosis in their families was calculated (adjusted age). The typical age at disease diagnosis in the family was taken as the median age at which affected family members were diagnosed with dementia. Two-tailed t tests were performed comparing biochemical measures in two populations: 1) between all mutation carriers (MCs, n = 12) and noncarriers (NCs, n = 9), and 2) the subpopulation of presymptomatic (CDR = 0) MCs (n = 8) and all NCs (n = 9). Exploratory correlations among biomarker levels as well as between biomarker levels and clinical status, age, and adjusted age also were performed. p Values of 0.05 or less were considered significant. All statistical analyses were performed using the Statistical Package for the Social Sciences, version 11.0.2. In the total population of 21 subjects, all had CDR scores less than 1. Four of 12 MCs and one of nine NCs had CDR scores of 0.5 (see table 1 for a summary of the study population). The reason this NC obtained a score of 0.5 is likely related to a lack of specificity of the CDR along with the fact that this evaluation was performed blind to the subjects’ genetic status. Data from this subject were therefore pooled with those of the other NCs. Twelve subjects were MCs and nine NCs. There were no significant differences between MCs and NCs with regard to mean age (34.8 vs 38.7), adjusted age (−10.8 vs −8.6 years), gender distribution (10/12 vs 8/9 females, p = 0.61), or number of persons carrying the ApoE ε4 genotype (2/12 vs 2/9, p = 0.59). MCs and NCs also did not differ with regards to mean Mini-Mental State Examination score (27.1 vs 28.1). Of the 11 subjects from whom CSF was obtained, 7 were MCs (5 with CDR scores of 0) and 4 were NCs. Among the 12 MCs, 8 were presymptomatic (CDR scores of 0). There were no differences between this group and the 9 NCs in regards to age (32.4 vs 38.7), adjusted age (−13.4 vs −8.6), or MMSE score (28.9 vs 28.1). The distribution of MCs vs NCs for the various genetic alterations for which they are at risk is not presented due to the necessity of maintaining confidentiality. Among all subjects, plasma levels of Aβ42 (21.4 pM vs 15.5 pM, p = 0.094) and Aβ40 did not differ between MCs and NCs although the ratio of Aβ42 to Aβ40 was higher in MCs (0.15 vs 0.11, p = 0.040, table 2). The difference between MCs and NCs in plasma levels of Aβ42 was larger in the presymptomatic (CDR = 0) group. Significantly higher plasma Aβ42 levels were found in eight presymptomatic MCs relative to nine NCs (25.1 pM vs 15.5 pM, p = 0.031, table 3). There were no differences in the levels of Aβ40 and the ratio of Aβ42/Aβ40 was higher in presymptomatic MCs (0.16 vs 0.11, p = 0.045). When MCs with CDR scores of 0.5 were included, these differences were no longer significant, consistent with a lowering of these levels with disease progression (figure 1). Among MCs, those with CDR scores of 0.5 had lower plasma Aβ42 levels than those with CDR scores of 0 (14.1 pM vs 25.1, p = 0.02). The differences in plasma Aβ42 levels between MCs and NCs were greater when subjects at risk for APP mutations were excluded. Specifically, in presymptomatic persons at risk for PSEN1 mutations, MCs had a mean plasma Aβ42 level of 29.1 pM compared to a mean plasma level of 16.0 pM in NCs (p = 0.005). Horizontal lines represent the median, boxes represent the 25th to 75th percentile, and whiskers represent total range. 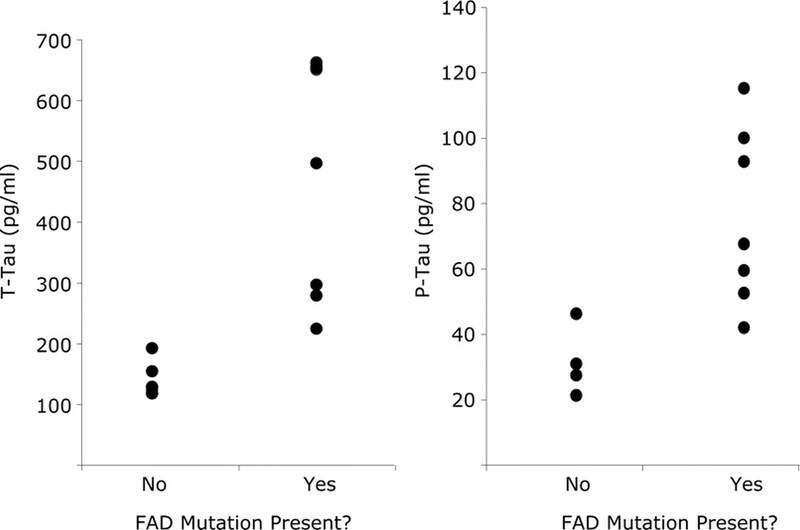 FAD mutation carriers with CDR scores of 0 have significantly higher plasma Aβ42 levels than either FAD mutation carriers with CDR scores of 0.5 or noncarriers. There was a trend for Aβ42 levels to be decreased in the CSF of FAD MCs compared to NCs (204.9 pg/mL vs 394.6 pg/mL, p = 0.053, table 2). Aβ40 levels were no different between groups and the Aβ42/Aβ40 ratio was significantly lower in MCs (0.08 vs 0.15, p = 0.046). If the comparison is restricted to MCs with CDR scores of 0, the difference is diminished (0.09 vs 0.15, p = 0.080, table 3). 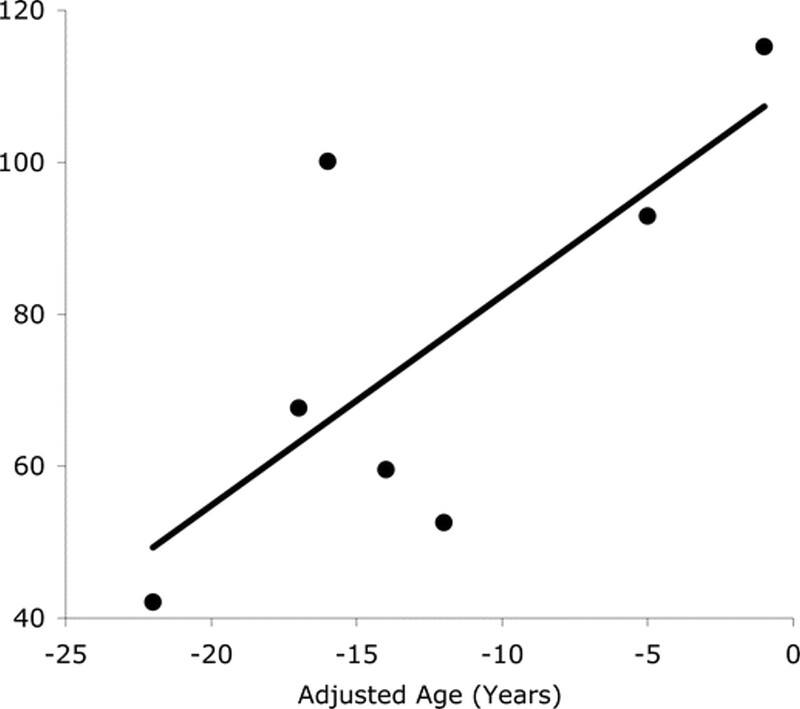 There was a trend toward a negative correlation of Aβ42/Aβ40 ratio in CSF with adjusted age in MCs (r = −0.673, p = 0.098) suggesting a possible decrease in this ratio as MCs approach the age of clinical dementia. Total tau and p-tau181 levels in CSF were elevated in presymptomatic FAD mutation carriers (figure 2). Total tau levels were 467.0 in MCs vs 148.9 pg/mL in NCs (p = 0.005, table 2) when subjects with CDR scores of 0.5 were included and 462.0 pg/mL in MCs vs 148.9 pg/mL in NCs (p = 0.025, table 3) when the analysis included only MCs with CDR scores of 0. Mean CSF phospho-tau181 levels were 75.8 in MCs vs 31.6 pg/mL in NCs (p = 0.005) when subjects with CDR scores of 0.5 were included and 72.5 pg/mL in MCs vs 31.6 pg/mL in NCs (p = 0.016) when only MCs with CDR scores of 0 were included. T-tau and p-tau181 levels are highly correlated in this population (Pearson correlation = 0.97, p < 0.001). There was a trend for p-tau181 levels to increase as the family-specific median age of dementia diagnosis is approached (Pearson correlation = 0.734, p = 0.061, figure 3). Among all subjects, there were no significant differences between plasma F2-isoprostane levels in MCs (345.6 pg/mL) compared to NCs (294.1 pg/mL, p = 0.143, table 2). In CSF, F2-isoprostane levels were elevated in MCs (n = 7, 48.6 pg/mL) compared to NCs (n = 4, 21.6 pg/mL, p = 0.031, table 2). When the analysis excluded two MCs with CDR scores of 0.5, the statistical significance was lost (p = 0.067, table 3). As smoking of tobacco is known to increase F2-isoprostane levels, MCs and NCs were compared with regards to smoking history. One out of 12 MCs was a smoker whereas four of nine NCs were smokers (two-sided χ2, p = 0.080). Therefore, smoking did not contribute to any differences seen and might indeed have masked greater differences between F2-isoprostane levels in MCs and NCs. No linear relationships between F2-isoprostane levels and age, adjusted age, mutation status, or clinical status were evident. We replicated the pivotal finding of increased levels of Aβ42 in the plasma of persons destined to develop FAD. Our data also provide preliminary support for a decline in this level with disease progression. We also found that the ratio of Aβ42 to Aβ40 in the CSF was reduced in preclinical FAD mutation carriers and may decrease as the age at onset of clinical dementia approaches. CSF t-tau and p-tau181 are elevated prior to overt symptoms and are highly correlated in this population. Our data also suggest that F2-isoprostane levels in the CSF begin to be elevated early in the course of FAD and therefore oxidative injury may contribute to the pathogenesis of this form of AD. Though elevated levels of Aβ42 in the plasma of persons fated to develop AD via PSEN1 and APP mutations is commonly cited as evidence supporting the “amyloid hypothesis” of AD, this observation has not been consistently replicated.27 With the small numbers of subjects in our study we were able to replicate this finding and provide additional, if preliminary, support for the observation that this level declines as the disease progresses. A recent study showed that a low plasma Aβ42/Aβ40 level in a cognitively normal elderly population predicted the development of MCI and AD within the next few years in an elderly population.28 This may be due to cerebral deposition of Aβ42 in this immediately presymptomatic phase. If one takes into account the higher baseline level of plasma Aβ42 in persons carrying FAD mutations, the lower level in persons with a CDR score of 0.5 in our study may represent a decline from a higher level. However, because of the small number of MCs with CDR scores of 0.5 (n = 4) this conclusion should be considered tentative. We did not identify a tendency for levels of plasma Aβ42 or Aβ40 levels to be elevated in subjects inheriting APP mutations (exact data not shown to maintain confidentiality with regard to mutation status). It is not clear if this is due to the small number of subjects in this study, their young age relative to the age at disease onset in their family, or other unknown factors. We also found a trend toward reduced Aβ42 levels and a significant reduction of the Aβ42/Aβ40 ratio in the CSF of preclinical FAD mutation carriers compared to NCs. This is consistent with previous studies in persons with established sporadic AD,7,13 persons inheriting FAD mutations,14 and in persons with mild cognitive impairment (MCI) who went on to develop dementia.29 At least one previous study failed to demonstrate a superiority of the ratio of Aβ42 to Aβ40 over absolute Aβ42 levels in CSF in differentiating patients with AD from controls.30 However, another recent study showed that CSF levels of Aβ42 and Aβ40 fluctuate in tandem 1.5–fourfold over a 36-hour period in controls without dementia.31 Measuring the ratio of Aβ42 to Aβ40 controls in part for this variability, possibly accounting for the greater effect of mutation status on this measure than was seen with absolute Aβ42 levels. The most commonly cited explanation for the lower CSF levels of Aβ42 in AD is a shift in equilibrium of Aβ species, particularly Aβ42, from the CSF to deposition in brain parenchyma. The pathogenic alterations in PSEN1 and APP that cause familial AD are thought to do so through the preferential production of Aβ42 over other Aβ species. Therefore, in FAD MCs, a higher level of Aβ42 relative to Aβ40 would be expected to be present in all tissues as a lifelong trait. Our finding of a decrease in the Aβ42/Aβ40 ratio in CSF with age in FAD MCs provides support for the preferential deposition of Aβ42 in brain as the explanation for its lower level in CSF. Further studies with greater numbers of subjects or longitudinal studies will help determine if this is the case. Similar to previous studies, we found elevated t-tau and p-tau181 in preclinical persons carrying FAD mutations.14,32 Unlike these studies, however, the elevations we found were sufficiently robust to reach significance, even with the relatively small number of subjects in our study. As CSF t-tau and p-tau181 increase with brain damage, the young age and healthy status of both our subjects and controls might contribute to the larger contrast we found between FAD MCs and NCs. There was a tendency for CSF levels of tau and p-tau181 to increase as the age at typical disease diagnosis is approached in FAD mutation carriers (figure 3). Total tau levels in the CSF are thought to reflect brain damage due to any type of insult whereas p-tau181 levels are thought to more specifically reflect damage due to AD. The close correlation of these two measures in our young subjects who would not be expected to have other, non-AD, CNS pathology supports this assertion. Oxidative stress is thought to play a role in AD and CSF, blood, and urine levels of F2-isoprostanes, products of oxidative metabolism, have been found to be elevated in persons with AD or MCI.15,16 In our sample we found elevations in plasma and CSF F2-isoprostane levels that reached significance in the CSF of MCs. Our results are consistent with the prior observation that F2-isoprostane levels are more consistently elevated in the CSF than in the plasma in sporadic AD.33 If it is assumed that overproduction of the 42-amino acid length version of Aβ is the primary cause of disease in these families, our data are consistent with the notion that oxidative stress is a phenomenon that occurs subsequent to amyloid mismetabolism. There are several limitations to our study. The small number of these rare subjects precludes controlling for many important covariates (PSEN1 vs APP, specific mutation, family of origin, ApoE genotype, age or relative age). The study is underpowered to detect any but the strongest correlations among biochemical variables and between biochemical and clinical variables. This was an exploratory study and we did not statistically adjust for multiple comparisons. Finally, it is unclear to what extent findings in persons with highly penetrant genetic forms of AD can be generalized to the more common sporadic AD of later onset. In this study we have verified the often-cited but seldom replicated observation of elevated Aβ42 in the plasma of presymptomatic carriers of FAD mutations. Furthermore, we have shown evidence that this level is not elevated in such persons exhibiting the initial symptoms of the disease though not yet demented, suggesting a reduction of this level with disease progression. Our data also confirm the observation that the ratio of Aβ42/Aβ40 in CSF is diminished in preclinical FAD and may decline with age in these persons. We have also demonstrated that elevations of CSF t-tau and p-tau181 are sensitive indicators of presymptomatic disease. Finally, the elevated F2-isoprostane levels in the CSF of preclinical persons with FAD mutations suggest that this change occurs downstream to mismetabolism of APP. e-Pub ahead of print on May 28, 2008, at www.neurology.org. Supported by PHS K08 AG-22228, CA DHS #04-35522, the Shirley and Jack Goldberg Trust, and the Brotman Foundation of California. Further support for this study came from Alzheimer’s Disease Research Center Grants P50 AG-16570, PHS R01 AG-21055 from the National Institute on Aging, General Clinical Research Centers Program M01-RR00865, an Alzheimer’s Disease Research Center of California grant, and the Sidell Kagan Foundation. Disclosure: William Seltzer is a consultant for Athena Diagnostics. Otherwise, the authors have nothing relevant to this study to disclose. Received July 20, 2007. Accepted in final form November 8, 2007. Wong CW, Quaranta V, Glenner GG. Neuritic plaques and cerebrovascular amyloid in Alzheimer disease are antigenically related. Proc Natl Acad Sci USA 1985;82:8729–8732. Scheuner D, Eckman C, Jensen M, et al. Secreted amyloid beta-protein similar to that in the senile plaques of Alzheimer’s disease is increased in vivo by the presenilin 1 and 2 and APP mutations linked to familial Alzheimer’s disease. Nat Med 1996;2:864–870. Mayeux R, Tang M, Jacobs D, et al. Plasma amyloid beta-peptide 1-42 and incipient Alzheimer’s disease. Ann Neurol 1999;46:412–416. Pomara N, Willoughby LM, Sidtis JJ, Mehta PD. Selective reductions in plasma Abeta 1-42 in healthy elderly subjects during longitudinal follow-up: a preliminary report. Am J Geriatr Psychiatry 2005;13:914–917. Fukumoto H, Tennis M, Locascio JJ, Hyman BT, Growdon JH, Irizarry MC. Age but not diagnosis is the main predictor of plasma amyloid beta-protein levels. Arch Neurol 2003;60:958–964. Sunderland T, Linker G, Mirza N, et al. Decreased beta-amyloid1-42 and increased tau levels in cerebrospinal fluid of patients with Alzheimer disease. JAMA 2003;289:2094–2103. Hulstaeert F, Blennow K, Ivanoiu A, et al. Improved discrimination of AD patients using beta-amyloid (1-42) and tau levels in CSF. Neurology 1999;52:1555–1562. Fox NC, Kennedy AM, Harvey RJ, et al. Clinicopathological features of familial Alzheimer’s disease associated with the M139V mutation in the presenilin 1 gene. Pedigree but not mutation specific age at onset provides evidence for a further genetic factor. Brain 1997;120 (Pt 3):491–501. Reimenschneider M, Lautenschlager N, Wagenpfeil S, Diehl J, Drzezga A, Kurz A. Cerebrospinal fluid tau and beta-amyloid 42 proteins identify Alzheimer disease in subjects with mild cognitive impairment. Arch Neurol 2002;59:1729–1734. Hesse C, Rosengren L, Andreasen N, et al. Transient increase in total tau but not phospho-tau in human cerebrospinal fluid after acute stroke. Neurosci Lett 2001;297:187–190. Zetterberg H, Hietala MA, Jonsson M, et al. Neurochemical aftermath of amateur boxing. Arch Neurol 2006;63:1277–1280. Andreasen N, Minthon L, Davidsson P, et al. Evaluation of CSF-tau and CSF-Abeta42 as diagnostic markers for Alzheimer disease in clinical practice. Arch Neurol 2001;58:373–379. Moonis M, Swearer JM, Dayaw MP, et al. Familial Alzheimer disease: decreases in CSF Abeta42 levels precede cognitive decline. Neurology 2005;65:323–325. Pratico D, Clark CM, Lee VM, Trojanowski JQ, Rokach J, Fitzgerald GA. Increased 8,12-iso-iPF2alpha-VI in Alzheimer’s disease: correlation of a noninvasive index of lipid peroxidation with disease severity. Ann Neurol 2000;48:809–812. Pratico D, Clark CM, Liun F, Lee V, Trojanowski JQ. Increase in brain oxidative stress in mild cognitive impairment. Arch Neurol 2002;59:972–976. Yao Y, Zhukareva V, Sung S, et al. Enhanced brain levels of 8,12-iso-iPF(2alpha)-VI differentiate AD from frontotemporal dementia. Neurology 2003;61:475–478. Cecchi C, Fiorillo C, Sorbi S, et al. Oxidative stress and reduced antioxidant defenses in peripheral cells from familial Alzheimer’s patients. Free Radic Biol Med 2002;33:1372–1379. Schellenberg GD, Bird TD, Wijsman EM, et al. Genetic linkage evidence for a familial Alzheimer’s disease locus on chromosome 14. Science 1992;258:668–671. Murrell J, Ghetti B, Cochran E, et al. The A431E mutation in PSEN1 causing Familial Alzheimer’s Disease originating in Jalisco State, Mexico: an additional fifteen families. Neurogenetics 2006;7:277–279. Yescas P, Huertas-Vazquez A, Villarreal-Molina MT, et al. Founder effect for the Ala431Glu mutation of the presenilin 1 gene causing early-onset Alzheimer’s disease in Mexican families. Neurogenetics 2006;7:195–200. Mullan M, Tsuji S, Miki T, et al. Clinical comparison of Alzheimer’s disease in pedigrees with the codon 717 Val–>Ile mutation in the amyloid precursor protein gene. Neurobiol Aging 1993;14:407–419. Athan ES, Williamson J, Ciappa A, et al. A founder mutation in presenilin 1 causing early-onset Alzheimer disease in unrelated Caribbean Hispanic families. JAMA 2001;286:2257–2263. Murrell JR, Faber K, Alonso ME, et al. The A431E Presenilin 1 gene mutation associated with familial Alzheimer’s disease in individuals of Mexican descent: evidence for a founder effect. J Neuropathol Exp Neurol 2003;62:543. Janssen JC, Beck JA, Campbell TA, et al. Early onset familial Alzheimer’s disease: Mutation frequency in 31 families. Neurology 2003;60:235–239. Morris JC. Clinical dementia rating: a reliable and valid diagnostic and staging measure for dementia of the Alzheimer type. Int Psychogeriatr 1997;9 (Suppl 1):173–176; discussion 177–178. De Jonghe C, Cras P, Vanderstichele H, et al. Evidence that Abeta42 plasma levels in presenilin-1 mutation carriers do not allow for prediction of their clinical phenotype. Neurobiol Dis 1999;6:280–287. Graff-Radford NR, Crook JE, Lucas J, et al. Association of low plasma Abeta42/Abeta40 ratios with increased imminent risk for mild cognitive impairment and Alzheimer disease. Arch Neurol 2007;64:354–362. Herukka SK, Hallikainen M, Soininen H, Pirttila T. CSF Abeta42 and tau or phosphorylated tau and prediction of progressive mild cognitive impairment. Neurology 2005;64:1294–1297. Schoonenboom NS, Mulder C, Van Kamp GJ, et al. Amyloid beta 38, 40, and 42 species in cerebrospinal fluid: more of the same? Ann Neurol 2005;58:139–142. Bateman RJ, Wen G, Morris JC, Holtzman DM. Fluctuations of CSF amyloid-beta levels: implications for a diagnostic and therapeutic biomarker. Neurology 2007;68:666–669. A, O Axelman K, Basun H, et al. Clinical findings in non-demented mutation carriers predisposed to Alzheimer’s disease: a model of mild cognitive impairment. Acta Neurol Scand Suppl 2003;179:77–82. Montine TJ, Quinn JF, Milatovic D, et al. Peripheral F2-isoprostanes and F4-neuroprostanes are not increased in Alzheimer’s disease. Ann Neurol 2002;52:175–179.